As you know, I love Audio Note UK gear. I've been lucky enough to play with a lot of it. I realize that most of it is super expensive, but not all. During the past few years, I have been fortunate to audition a variety of phono stages from Audio Note UK and compare them to other phono stages that various manufacturers have loaned to me. I have heard AN’s higher-end preamps with built-in phono, such as the M6-Phono and M9-Phono (in current use in my all AN system), as well as AN's stand-alone phono stages, such as the M2-RIAA and M6-RIAA. Now Warren Jarrett (my local Los Angeles area's AN dealer and good buddy) supplied me with a very short term loan of AN’s least expensive phono stage, the R-Zero/II. In fact, it is also AN’s least expensive component of any kind, not including cables and cartridges. I suspect it a kind of statement product for them, to demonstrate that they don’t compromise sound just because something they make is “cheap” by their standards. It's a moving magnet phono stage, uses cute little mini-tubes and is small (compared to most Audio Note pieces), but doesn't SOUND small. In fact it sounds mighty. What I found, when comparing the various AN phono stages, is that the less expensive models actually don’t sound “cheaper” than the more expensive ones. What they do is sound different. The R-Zero clarifies this conclusion (that I started to believe listening to the fine M2-RIAA) because it is very dynamic, liquid sounding, silent when music is not playing; it has a full, rich tone, plenty of volume and even at this low price point, it has a recognizable Audio Note UK sound. This is plenty to qualify it as a full-fledged audiophile product, despite its price. Back to sounding “different” from the more expensive AN phono stages, the R-Zero/II doesn’t sound less dynamic, less liquid, less silent, or less rich in tone. What is does provide is a more universal sound, as though it is designed to work with a wide variety of associated equipment. It sounds more linear and less warm than the M6 and M9, as though these preamps are optimized for use within a full AN system. It is very close in sound to the M2-RIAA I have listened to for many months now. The M2-RIAA resolves very subtle nuances (such as minute details and ambience cues from an acoustic space) with more sophistication, but this difference is only evident in a direct comparison. So the R-Zero/II is a remarkable unit, in the line-up of Audio Note’s phono stages. For someone who wants to join the Audio Note UK world, this is a good starting point, compatible in any audio system, but also completely representative of Audio Note’s distinctive sound. It features a pair of 6112WA miniature dual triodes, a nicely built tube MM phono stage that will hold its own! This organic sounding phono stage for MM carts is $1,345.00 USD. An amazingly low price for something built by AN. After enjoying Audio Note's least expensive phono preamp, the R-Zero, now I am curious to explore more of their "M#-RIAA" offerings. I just returned the R-Zero to Warren, who loaned it to me for a review; I have a M2-RIAA, that I have been using for an extended period of time (well, actually Warren is now borrowing that from me); and I have an M6-RIAA, that I also have been using as a backup. What @Warren Jarrett and I have decided, and confirmed by the Audio Note UK factory, is that Warren can sell this M6-RIAA, as a like-new demo, for 1/2 price, and ask Audio Note to use that sale towards less expensive products for me to hear and review. If anyone would like to buy the amazing M6-RIAA stand alone phono stage, for 1/2 price, please contact Warren directly. I believe it will be under $9,000, but not by much. This model is just below AN's top-of-the-line M8-RIAA, which retails for over $40,000. There is no M7-RIAA nor any RIAA above M8. And as soon as this M6-RIAA finds a new home (as much as I will miss it), I will get more toys to play with, and share with all of you what I hear. SirMarc, Dmann201, Manimal and 10 others like this. Oops, I put too high a price for the Audio Note UK R-Zero/II. The price is $1,345.00 Such a deal! SandAndGlass, bluemooze and Seafinch like this. Steve, thanks for your very thorough review (and pictures) of this phono preamp. It is a reasonably priced phono preamp, considering that it is an Audio Note component. I have always admired Audio Note gear but I never quite understood why there is an Audio Note UK and an Audio Note Japan. I don't mind getting into this, because it is an interesting history. I have spoken to Audio Note Kondo and Audio Note (UK) about this. It started with Audio Note in Japan giving full worldwide exclusive distribution of Audio Note equipment to their dealer in the UK. Their contract was explicit, and when they had disagreements of what and how to market, Audio Note in Japan couldn't overturn any of the specific terms this dealer had. They had rights to control the equipment and name only in Japan. The dealer maintained all rights to the name AND the products' design outside of Japan. This understanding and contract was clear-cut and determined by all as fair from the beginning. AN turned into two companies, designing and selling some similar and some very different equipment. AN-Kondo was committed to building each product only one way, the best they possibly could with no compromise to price, and no desire to expand their product line nor their customer base. AN (UK) started to build their own no compromise versions of the same equipment, plus offer less expensive versions using less expensive internal components, so that customers could have a choice of price they are willing to pay. AN-Kondo hated this compromise idea ; AN (UK) thought it was a great idea for the benefit of more customers to own awesome SET amps (for example), to grow AN sales volume, and to expand into building more equipment types, for example speakers, turntables and CD players. AN (UK) has so many interesting ideas, about such a wide variety of products, it would have been a great loss to the audiophile community if AN-Kondo had been successful in restricting them to their limited and ultra-purist approach only. Some people say that the AN (UK) approach diluted the exclusivity of the Audio Note name. Well, Peter Qvortrup's whole approach to life is NOT to be so exclusive and detached from the world of ALL people, so he certainly would never condone limiting a brand of equipment ONLY to the "wealthy class". Personally, I can say that I very much enjoy the concept that any product can be ordered from the factory, with a choice of internal parts quality levels, at necessarily different price levels. Steve's review of the R-Zero supports AN (UK)'s vision to make high-end audio affordable to anyone. NOS300B, googlymoogly, Fabrice and 3 others like this. Thanks for the detailed reply. That helps me understand the issue. It's a real loss leader, obviously. Great price. The build and parts quality seem crazy good for this price...a serious deal. The only place it takes a hit value wise is it is MM only. SandAndGlass and Seafinch like this. Thanks for the review. Very tempting. I'd need to use a SUT with my DL103. I did not know that..truth be told, I have not been sold on MC.. I haven't asked Peter Q. about it, but I'm sure his idea is that a step-up to MC should be precise and match the MC cart exactly. In MM, there is a fixed setting but anything goes for MC. All I know is that the AN MC step-ups match the AN MC carts exactly, no guesswork..
Yep, it's crazy. Should have a warning label: No user adjustable settings inside! Which is what I guess the Audio Note MC step ups have, one setting, no adjustments. There have been many designers of tube electronics who say that it is not technically or realistically possible to design a tube phono stage that will correctly amplify a signal of less than 1.0 mV up to line level. Some have actually done it, but do those have low enough noise and good enough sound? Audio Note is sure the answer is no, it cannot be done AND sound good. So AN recommends an active phono preamp standard to start with of Moving Magnet level (2.5 to 4.0 mV) and Moving Magnet input impedance (47 kOhms). For playing any low output MC cart, use a transformer step-up, to boost level and transform impedance to that standard. EAR and CAT, for example, provide a transformer ahead of their active phono stage for this purpose. But whatever transformer they choose, it can only boost and transform correctly for a limited number of cartridges, and is of a compomised quality to keep the preamp in its target price range. So they recommend a phono preamp standard to start with of Moving Magnet level (2.5 to 4.0 mV) and Moving Magnet input impedance (47 kOhms). For playing any low output MC cart, use a transformer step-up, to boost level and transform impedance to that standard. Thank you. i think this is a very informative post. I absolutely love the phono stage in my M3 Phono Preamp - that is the single biggest improvement. I will eventually buy the IQ 3 - stepping up to MC for AN is very costly - the cartridge plus the step up would run 4-5 times the price of AN's best MM cart. One note on prices - The Audio Note AX One and AX Two speakers (hand made in Denmark) are less expensive and so is the AN DAC 0.1x which is $1337. Both speakers $1k and under. AX Two left - AX One right. SandAndGlass and bhazen like this. Steve - can you say how it compares to the internal phono stage in your Oto? I've the original R-Zero. Not sure how it differs, other than having a 6111WA input valve (and 6112WA output), but yep it's that organic quality to the sound. CAT, for example, provide a transformer ahead of their active phono stage for this purpose. But whatever transformer they choose, it can only boost and transform correctly for a limited number of cartridges, and is of a compomised quality to keep the preamp in its target price range. [...] One note on prices - The Audio Note AX One and AX Two speakers (hand made in Denmark) are less expensive and so is the AN DAC 0.1x which is $1337. This may be a silly question, but is there an Audio Note Zero Series stereo power amplifier? I know there are P-Zero monoblock amplifiers that are hidden on their website. Would love to have Steve review some of these in the future if possible, I appreciate the time that you took to review some of their more affordable options. Audio Note makes such a bewildering array of stuff; it occurred to me ... who designs it all?? They must have a sizable staff of engineers, no? The AX Two in my opinion is better than the Harbeth P3ESR or LS-3/5a or Tablette. But I am biased since I have one. The AX One looks to me to be an upgraded Rogers LS-1. 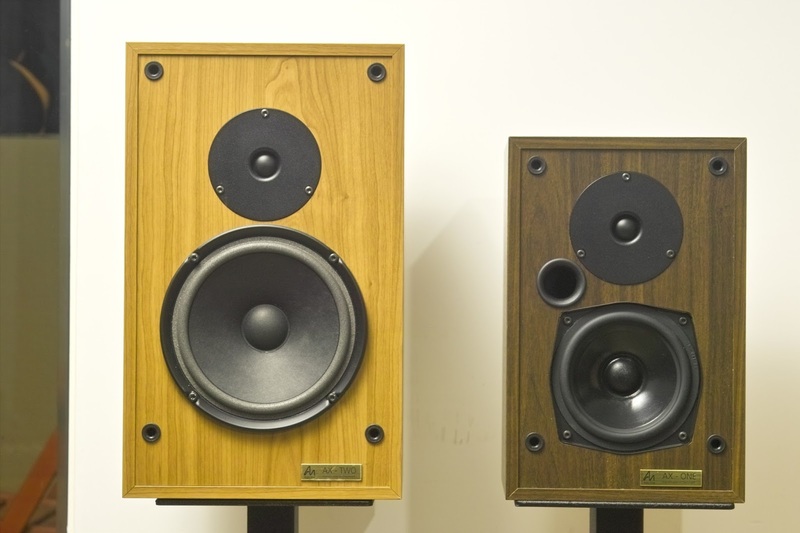 Since Andy Whittle designed speakers for Rogers and is an LS-3/5a guru (which the P3 essentially is as well) then there are some similarities. But the AX Two IMO does a better job with piano, tone and the drivers integrate better - the LS-3/5a has a hick-up between drivers that over time bug me too much - I understand it in a recording studio setting but I never understood the popularity over time - at least not at the Harbeth price - over $2,000? When the AX Two which sounds better is $1,000?